The Missouri Poison Center never takes a break-we are available 24/7/365. The specialists at the Missouri Poison Center will offer you a timely follow-up phone call to make sure that things have improved and see if you have any questions. A frantic parent calls about his young daughter getting into a bottle of peppermint oil. She smells strongly of peppermint, the skin around her mouth is red and she is crying. He has no idea how she was able to open the bottle. He reads the warning label on the bottle which states to keep out of the reach of children and to call the poison center for accidental ingestion. Luckily he had prepared himself for such an event and had the number to the poison center programmed into his cell phone. He was able to speak with an expert right away who gave him instructions to wash with soap and water, rinse out her mouth, and give her something to drink. An hour later the poison center called him back; the redness on her face was gone, she had some water to drink and she was back to being happy and playful. Dad was relieved that help was just a phone call away to the poison center, and the poison center was happy to help because that’s what we do 24/7/365. 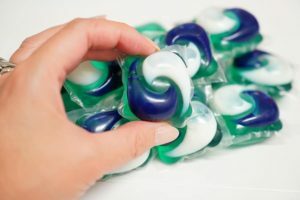 A 25 year old woman called the poison center because a Tide Pod® burst and she got some of the liquid into her eye. She was at a laundry mat, but was able to rinse her eye thoroughly. She states that she thinks that she rinsed for 20 minutes. The MPC nurse discussed the risk for corneal injury (damage to the front covering of the eye) from the concentrated detergent and was able to watch her at home because of the excellent irrigation completed. On follow-up, the redness was resolving and the pain was almost gone. The woman was grateful that she was able to stay at home for this exposure and avoid an unnecessary and costly hospital visit.